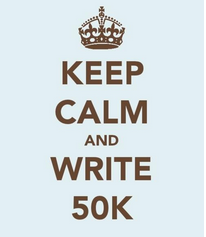 National Novel Writing Month AKA NaNoWriMo has begun and writers across the globe are in a writing frenzy. Some writers find that the first few days are full of novelty and excitement making it easier to get the words down, later they lose steam and some stop all together. Other's struggle to get started. Writing 50K words in a month is not easy. It can be done though. Thousands of writer's reach their goal every November and proudly show their winners badges. 1) Prizes. Some writers give themselves treats when they meet certain word counts. A friend of mine opened a bottle of champagne when she got past 10K. Others treat themselves to a massage or get themselves something they've wanted for a while. Personally I do things like treating myself to a chocolate bar for 500 words written, or watching a film or an episode from one of my favourite shows after I've hit my goal for the day. The idea is to motivate yourself to get it done and to give yourself a pat on the back for having done it. 2) Writing sprints. Some writers work better under pressure or in contest mode. On social networks like Twitter and Facebook you can find people to challenge in word battles by using hashtags like #WordBattle, #WordWar or #WritingSprint. You then set a start time and see who can write the most within the agreed time. 200 words here, 500 words there, and you'll hit your daily goal. 3) Write when you're most productive. Most of us have times of day when we're most productive. If you know you get most done in the morning, make time to write then. You can always try to boost it up later on but you'll have got down the bulk of your count. 4) Take some time off. I know it might sound a bit wrong but taking time off can make a big difference. You recharge your batteries and can also find inspiration and fresh ideas for your novel. You'll come back to your novel with new found energy. Just make sure you don't take too much time off. 5) Just write. Whilst the other tips can help this is the only one that really makes it or breaks it. Just write. The words will come and your story will unfold. It doesn't need to be perfect. The goal is to get a first draft down. You have plenty of time later for revisions and editing to polish it.